Baker Bowl is the best-known popular name of a baseball park that formerly stood in Philadelphia, Pennsylvania, United States. Its formal name, painted on its outer wall, was National League Park. It was also initially known as Philadelphia Park or Philadelphia Base Ball Grounds / Park. The ballpark's second incarnation opened in 1895. It was notable for having the first cantilevered upper deck in a sports stadium, and was the first ballpark to use steel and brick for the majority of its construction. It also took the rule book literally, as the sweeping curve behind the plate was about 60 feet (18 m), and instead of angling back toward the foul lines, the 60-foot (18 m) wide foul ground extended all the way to the wall in right, and well down the left field line also. The spacious foul ground, while not fan-friendly, would have resulted in more foul-fly outs than in most parks, and thus was probably the park's one saving grace in the minds of otherwise-frustrated pitchers. Baker Bowl's right field wall in 1937 after the metal screen was added to extend the total height to 60 feet (18 m). Notice the Phillies advertisement for Lifebuoy Soap along the length of the wall. An often-told joke was that even if the team used the product, they still "stunk". The ballpark, shoehorned as it was into the Philadelphia city grid, acquired a number of nicknames over the years. Baker Bowl is the best-known name, and is nearly always referred to by that name in histories of the Phillies. 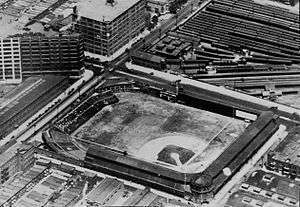 The prosaic "Philadelphia Baseball Grounds" or "Philadelphia Baseball Park" was the name often used by sportswriters prior to the Baker era. Photographs during its later years show the sign on the ballpark's exterior with the equally prosaic label "National League Park". "Huntingdon Street Grounds" was a nickname for a while, after the street running behind the first base line. Baker Bowl, also called "Baker Field" in the baseball guides, referred to one-time Phillies owner William F. Baker. The use of "Baker Field" was perhaps confusing, since Columbia University's athletic facility in New York City was also called Baker Field. How it acquired the unique suffix "Bowl" is subject to conjecture. It may have referred to the banked bicycle track that was there for a time, or it may have been used derisively, suggesting non-existent luxuriousness. "The Hump" referred to a hill in center field covering a partially submerged railroad tunnel in the street beyond right field that extended through into center field. Outfielders would occasionally feel the rumblings of the trains passing underneath them. During the 51½ seasons the Phillies played there, they managed only one pennant (1915). 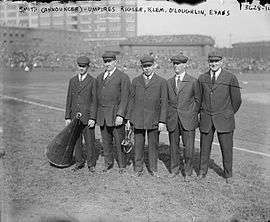 The 1915 World Series was significant in that it was the first time a sitting president attended a World Series game when President Wilson attended and threw out the first pitch prior to Game 2. The Series was also the first post-season appearance by Babe Ruth, and the last to be played in a venue whose structure predated the modern World Series. Fire destroyed the grandstand and bleachers of the original stadium on August 6, 1894. The $80,000 in damage (equal to $2,191,692 today) was covered fully by insurance. The fire also spread to the adjoining properties, causing an additional $20,000 in damage, equal to $547,923 today. While the Phillies were playing a short road trip and then staging six home games at the University of Pennsylvania Grounds at 39th and Spruce, a building crew worked around the clock to erect temporary bleachers. The makeshift stands were finished in time for a game on August 18. During the 1894-1895 off-season, the park was fully rebuilt of mostly fireproof materials and an innovative cantilevered upper deck. It also contained a banked bicycle track for a while, exploiting the cycling craze of the late 19th century. In terms of pure design, the ballpark was well ahead of its time, but subsequent problems and the parsimony of the team's owners undermined any apparent positives, as the ballpark soon became rundown and unsafe. Some distinctive buildings visible in vintage photos of the ballpark remain standing and help to mark the ballpark's former location. One is the roughly 10-story-tall, triangular building across Lehigh to the north-northeast, behind what was centerfield. It was originally a Ford Motor Company building, and was completed at some point prior to the 1915 World Series. Another is the neoclassical North Broad Street Station train depot building across Broad Street from what was the end of the first base grandstand. 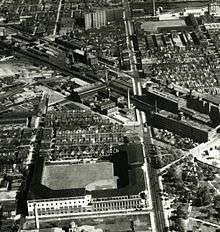 It was built in the 1920s and is visible in later aerial photos of the ballpark. The building itself now houses a homeless shelter. 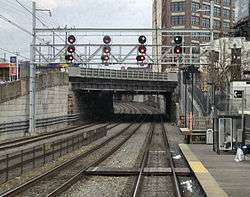 The modern North Broad (SEPTA station) stands nearby. 1 2 3 4 5 6 7 Jordan, David (2010). Closing 'Em Down: Final Games at Thirteen Classic Ballparks. USA: McFarland Publishing Company. p. 216. ISBN 9780786449682. ↑ Gordon, Robert (2005). Legends of the Philadelphia Phillies. Sports Publishing LLC. p. 3. ISBN 1-56639-454-6. Retrieved June 3, 2009. ↑ Shields, Gerard (February 28, 2010). "Hope is eternal, even for Phillies fans". The Philadelphia Inquirer. Retrieved August 22, 2010. ↑ "Phils Set to Close Deal for Use of Shibe Park". The New York Times. June 26, 1938. ↑ Westcott, Rich (1996). Philadelphia's Old Ballparks. Temple University Press. p. 51. ISBN 1-56639-454-6. Retrieved June 2, 2009. ↑ Didinger, Ray; Lyons, Robert S. (2005). The Eagles Encyclopedia. Temple University Press. p. 199. ISBN 1-59213-449-1. Retrieved May 27, 2009. ↑ Jenkinson, Bill (2007). The Year Babe Ruth Hit 104 Home Runs: Recrowning Baseball's Greatest Slugger. Carroll & Graf. ISBN 0-7867-1906-0. ↑ "Another Baseball Park Fire". The Christian Recorder. August 9, 1894. ↑ Macht, Norman L.; Mack, III, Connie (2007). Connie Mack and the Early Years of Baseball. University of Nebraska Press. p. 316. ISBN 0-8032-3263-2. Retrieved May 22, 2009. ↑ "Alternate Site Games Since 1901". Retrosheet. Retrieved May 22, 2009. ↑ "Baker Bowl National League Park". Pennsylvania Historical and Museum Commission. Archived from the original on May 12, 2005. Retrieved June 2, 2009. ↑ Warrington, Bob. "Baker Bowl Honored with Historical Marker at Dedication Ceremony!". Philadelphia Athletics Historical Society. Archived from the original on September 8, 2008. Retrieved June 2, 2009.